Enough to bring you back? Update: Hello Games has fully unveiled its new Path Finder update, and it's a big one. We've added full details of the new features below. It’s safe to say No Man’s Sky disappointed many upon its release last year. What was billed as an epic space exploration game ended up feeling barren and devoid of meaningful progression or content. To its credit, developer Hello Games has been hard at work righting the game’s original wrongs since its release, and has just announced the Path Finder Update, which is due to be released later in the week. 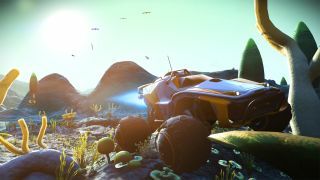 The big addition with this update are new vehicles which you can use to get around (not to mention race around) your home planet, a concept introduced in the previous Foundation update, a lot more easily. Speaking of your home planet, you'll also be able to show off your constructions to other people for the first time. This is enabled through Steam Workshop integration, which you can use to upload your bases for others to enjoy. On the console side of things, the game will be receiving full PS4 Pro support. The game will support full 4K resolution, as well as HDR. The game will also allow you to own multiple vehicles, which can be stored and perused in a giant hanger. There are a lot more features coming with the new update which can be read about in full on the No Man's Sky website. For what it’s worth, our issues with the game were less about the mechanics of it and more about there simply not being enough to do in the universe of No Man’s Sky. If updates such as this continue, then the game could evolve into a much more compelling experience.